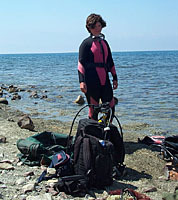 Zelenko's Mountain Divers "Beneath the Black Sea"
A good amount of Meganom's western flank is accessible by foot, so we make plans to take some photographs and preliminary measurements of the tenth-century wreck site. Toly Tcymbal, a good friend of UARTC and occasional team member, offers his car for the trip out to the cape. We somehow manage to cram five people and three sets of gear into the car, crawling slowly over Mt. Hawk towards Meganom. In Sudak, we're stopped by a policeman. Ahead of us, the street is thronged with people. The president of Ukraine, Leonid Kuchma, is in town, and the only way to pass through Sudak is along the narrow, rutted dirt roads that link the "suburbs" of town. We join a slow moving convoy of vehicles attempting to negotiate the detour through half-finished apartment buildings, piles of bricks and gravel, and tangles of rusty cable. Zelenko leaps out of the car once in a while to clear large rocks out of our path. "Dyakulu, Kuchma," I joke. Thanks, Kuchma. We finally arrive at Meganom and park on a high bluff overlooking the cape, spilling out of the car like some bad circus act. "Do you smell gas?" somebody asks. It appears that we nicked something during our perilous passage through Sudak, and a small puddle is beginning to form underneath the car. I throw on my BC, hang my regulator around my neck and grab my suit. Time for some mountain diving. Back on the bluff it's time to address the next problem: patching up the gas pipe. A piece of rubber hose and a scrap of wire will do the trick, and we set off in different directions in a sort of auto-repair scavenger hunt. Normally, people seem to have no compunction in dumping all sorts of items along the beach, but, unfortunately for us, the litterers at Meganom specialize only in empty booze bottles. An hour and a half later Toly manages to jerry-rig something with a roll of electrical tape. Dyakulu, Kuchma. 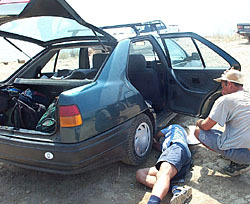 Dyakulu, Kuchma: Zelenko offers moral support while Toly attempts to patch up a gas leak with a roll of electrical tape. 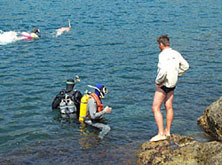 Mountain Diving, Part II, begins the next day, with four sets of dive gear distributed among six people for the hike out to Tsar Bay. I struggle to keep up along the foot-wide path down to the water, readjusting my gear and trying not to look down at the rocks another 20 feet below. Maybe it was the training that these guys received in Young Pioneer Camp (a sort of Soviet Boy Scouts), or perhaps all Ukrainians are half mountain goat, but I'm consistently amazed at the places people here climb to while outfitted in nothing more than a bathing suit and a pair of broken flip-flops--destinations that most Americans wouldn't attempt without first consulting an L.L. Bean catalog. Picturesque Tsar Bay. Our diving base is directly at the bottom of this cliff. On their way to investigate the strange appearance of hydrogen sulfide in the bay, Loscha and Ivanov dodge frolicking vacationers. I had incorrectly assumed that we were diving to further investigate some earlier reports of ceramic finds in Tsar Bay; rather, Loscha, a marine biologist by training, wanted to investigate a rare hydrogen sulfide patch that had appeared in the center of the bay. (Below approximately 300-500 feet, the Black Sea is saturated with hydrogen sulfide, a compound generally produced by rotting vegetation.) Zelenko and I swim out along the bottom of the bay to position some buoys, across the pale, sandy bottom littered with rocks and empty champagne bottles as enormous party boats churned overhead. A large black sulfide patch, maybe 15-20 feet in diameter, with tiny bubbles rising from its surface comes into view. Curious, I poke my knife into the patch; it's like an underdone souffle, and the entire surface jiggles when I pull the blade out. We tie the buoys onto some nearby rocks and head back to shore. 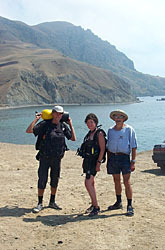 I warm up on a sunny rock while Loscha and Ivanov head down to take some measurements. I'm a bit disappointed, as this was the last dive of my trip (standard dive safety practice requires a 24-hour "land interval" between diving and air travel) and instead of making some sort of fantastic archaeological discovery, I played lackey to a marine biologist. So it goes. I check the status of my numerous blisters and most recent jellyfish sting, and contemplate future destinations. This has been my fourth consecutive "working vacation" in a former Soviet republic, and my second in two months. I lie back for a quick snooze before the return hike to camp. Drifting off, I resolve that my next trip will be to a place where I don't have to carry my own clean needles (for medical emergencies), and where the bartenders know how to make a decent martini. 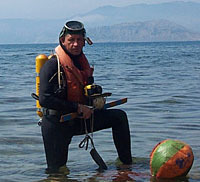 The evening before I leave, Zelenko goes to talk to a local diving club whose members have been spotted in the area of the thirteenth-century wreck. 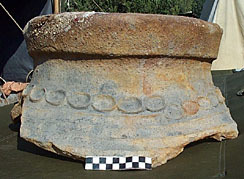 He returns to camp cradling a large pithos fragment recovered by club divers near the wrecksite and sets it down on the mess table. "Also thirteenth century," he says quietly. We cook up a pot of tea and review the work that has been done by UARTC this season, and in particular the three weeks I spent with the expedition. Zelenko will be shutting down the camp in a few days, and I ask him about his plans for the next season. He'd like to establish another camp on the eastern flank of Cape Meganom and continue his search for the Venetian wrecks. We toss around ideas about boats and remote-sensing equipment and expanded international partnerships, but we both know that even if all of these ideas go unrealized, Zelenko and his UARTC team will be out there on Meganom's rocky shores, looking for those wrecks. "Well, I hope it was O.K.," Zelenko says to me, folding and refolding his map of the coast. 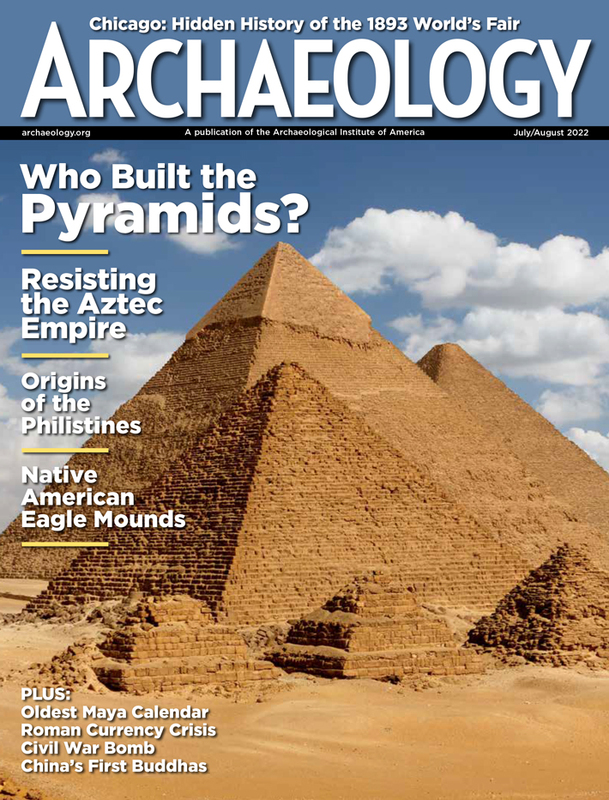 "It's not Bozburun, you know," he laughs, referring to his visit to the INA Byzantine shipwreck excavation that I worked on in Turkey in 1997, a well-funded excavation with nitrox (enriched air) diving, a camp with electricity and running water, and conservation and computer labs. "Yeah, but I heard Tektas isn't as cushy," I reply. 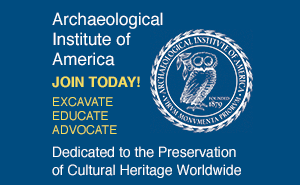 Zelenko leaves later in the week for Turkey, where INA is currently excavating a fifth-century B.C. wreck at Tektas Burnu. He smiles and shrugs. I drain my cup and look out over Novy Svet. The sky is inky black, with a scatter of stars and the cloudy streak of the Milky Way. Bats dive out of the trees while competing bass lines from the seaside dance clubs spill back up the hills. Zelenko's turned his attention back to the pithos fragment, examining the shoulder detail under a single bare bulb, the only light in camp. I wish him heartfelt good luck and head off to pack.